For those of you who wondered what happened to last week’s post: I took a week off, following a small surgical procedure, which went very well, but left me with a little more need for relaxation than I had anticipated :). I had meant to drop you all a note – I hope you didn’t get worried! 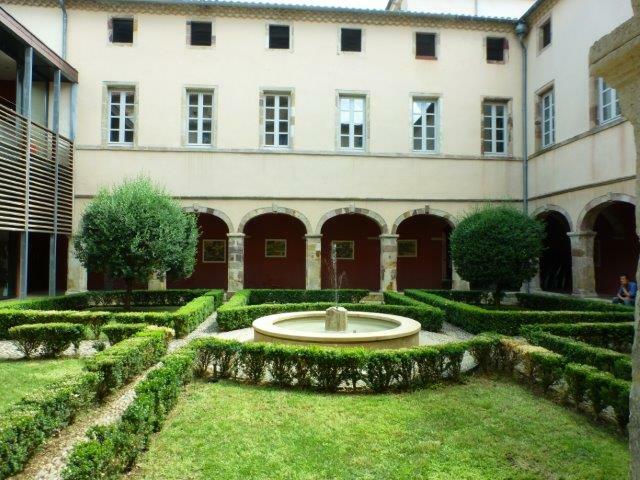 One of the relaxing things I managed to do later in my recuperation, was a visit to a new art gallery, La Remise du Fada, in Ginestas, not all that far away from Saint-Chinian. The gallery has been created in a former barn, so the space inside is large and airy. The conversion has been beautifully done, with floors made from reclaimed wood and natural stone, and the new barn doors are impressive to say the least. The inaugural exhibition is showing the work of seven different artists – the show will be on for three months! I had received an invitation to the vernissage from Pierre-Regis Dides, whose pictures I have previously written about here. Pierre-Regis was showing a selection of his paintings, and one of them (my favourite from the last exhibition) had been framed by the gallery owner for the show. It looked even better, but alas, I don’t have a wall large enough for it! I was also very pleased to see the work of Thomas Darnell, a painter I have known for a very long time. In this exhibition Tom is showing fine art prints of some of his paintings. I did not realise that the pictures on show were prints, until Nicole, Tom’s wife, pointed it out to me. Tom’s paintings tend to be very large, and the advantage of the prints is that they come in three different sizes. They are also a lot easier on the pocketbook than one of Tom’s original paintings :). You can find Tom’s site for the prints here. I also saw the work of Thalia Reventlow, a Danish artist, whom I met through friends many years ago. I loved her chickens, but don’t be deceived, Thalia is a very serious ceramicist! Serge Griggio’s paintings had an air of mystery about them, as if the empty chairs were waiting for someone to sit down. 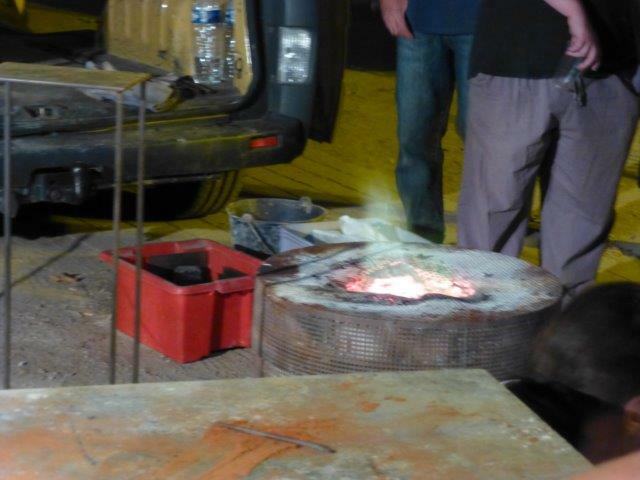 Lionel Laussedat‘s steel sculptures are made in his workshop in Serignan. The sculptures range in size from the very manageable, such as the two in the pictures below, to more monumental pieces which are on display in public spaces all over the world. Flores Alders‘s paintings are bold and colourful. He draws his inspiration from the Fauvism movement. So there you have it – a very interesting exhibition in a wonderful new gallery. If you are in the area, do go and visit, but I would suggest that you telephone ahead (+33 679 673 475) to make sure that the gallery will be open. 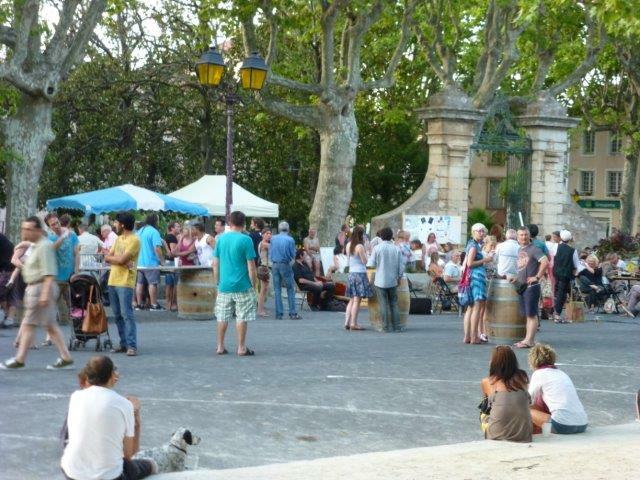 In the summer there is so much happening in and around Saint-Chinian that it is often difficult to keep track of it all! I’ve been visiting quite a few exhibitions of late and want to share a few of them with you. Perhaps you’ll be able to visit some of them yourselves? First is an exhibition by an artist who is a resident of Saint-Chinian: Pierre-Regis Dides. 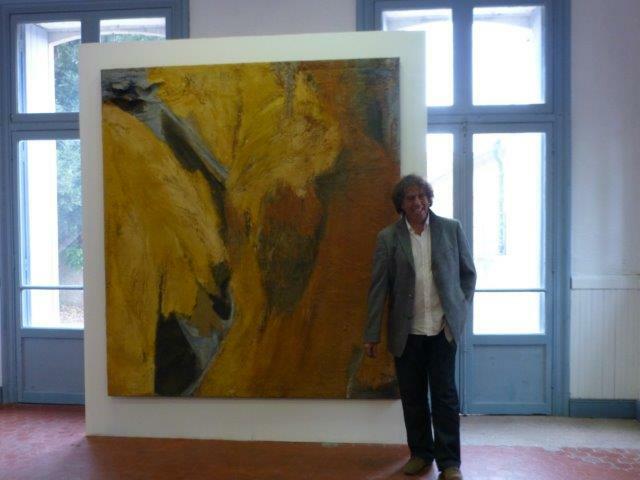 His paintings are shown at Chateau Vargoz in the town of Serignan, just across the street from La Cigaliere theatre. The building belongs to the town and is a typical example of a 19th century mansion, having been built by a wealthy wine growing family. The pictures are the star attraction though – ranging from the large, almost monumental to very small tile-sized paintings. Pierre-Regis draws his inspiration from the landscape around Saint-Chinian. His works are highly textured and multi-layered. The photographs give you an idea of the colours, but you really need to see them in real life to be able to fully appreciate them! The exhibition at Chateau Vargoz is on until August 22, 2015, and is open Thursday to Saturday from 3pm to 7pm, or by appointment (+33 676 656 772 or +33 675 237 795). There are several pictures which I could quite happily live with!! 🙂 More information (in French) about Pierre Regis can be found here. The next two exhibitions I want to share with you, are currently running in Saint-Chinian. In the cloisters of the former abbey (now the town hall) is an exhibition of paintings and drawings by Denis Carriere. The theme of the exhibition on show is Saint-Chinian and surrounding areas, and Denis Carriere has beautifully captured everyday scenes in the village, such as the market and the river. This exhibition is open every day until August 30, 2015 during the opening hours of the town hall. The second exhibition in Saint-Chinian is presented in the gallery adjacent to the library, on the first floor of the town hall building. The exhibition is named Florence or the cult of beauty and looks at the drawings of the Renaissance under the Medici dynasty from 1389 to 1574. There is an amazing range of artwork on show by such illustrious artists such as Leonardo da Vinci, Raphael, Michelangelo, Botticelli and others. This exhibition is open until the end of August, during the opening hours of the municipal library. Entrance to all exhibitions is free of charge! It all took place in the market square and the gardens of the town hall. The road in between had been closed to traffic, creating one vast space. The evening was balmy and many people abandoned their televisions for a look at what was going on!! I wasn’t familiar with most of the artists, except for one: Pablo Quedad, whose work I have previously seen at the Lezard Bleu in Vieussan, and at Mons la Trivalle where Pablo lives and works. During the evening Pablo created a figure out of empty drinks cans – highly inventive!! I didn’t stay quite long enough to see the figure entirely finished; I wonder whether he would have added a head? The lights/wooden sculptures took on a whole new dimension in the dark! Another artist was working on carving a gigantic block of polystyrene! Much harder work than one would think, especially since it was such a warm summer’s evening!! All in all a great event, and one which will be repeated next year.